The Traffic Locator defines the road graph on which entities can move, thanks to the Traffic and Traffic Goto behaviors. 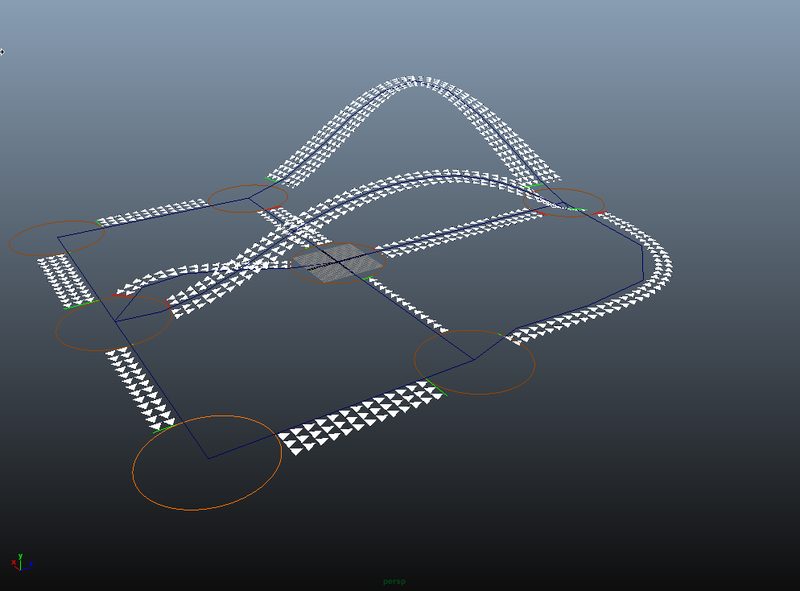 It is built upon Maya nurbs curves, and a specific locator to represent crossings. A road graph is basically defined by adding the curves (roads) to the traffic locator, and defining how much lanes each curve has. A Traffic Locator is automatically created when a Traffic or Traffic Goto behavior is added to the simulation. Note that several Traffic Locators can be used in a simulation and can be chosen in the Crowd Manager and in each Crowd Field. Thus, if two Crowd Fields are using two different Traffic Locators, their Entities will not be able to avoid each other. When two crossing vehicles both have curvy trajectories, the collision avoidance may not detect future collisions soon enough. In that case an immediate stop of the vehicle can occur when it detects the collision between both vehicles boxes, ignoring the maximum deceleration configured. Lane changing is not taken into account, therefore some cars may queue up in one lane while the neighbor lane is empty. There is no specific process to make pedestrian entities interact with vehicles and traffic yet. When curves are added to the Traffic Locator, some parameters are added to them to define their traffic properties. All these parameters can be tweaked per lane once the curves are added to the locator, in their Extra Attributes section. Sample Count The curve is sampled to build each lane. The sample count influence the smoothness of orientation and fidelity to the original curve. Once the roads are defined, the crossings can be auto detected : when hitting "Autocompute Crossings", each road end will have its crossing, which will be shared with curves ending on the same position. 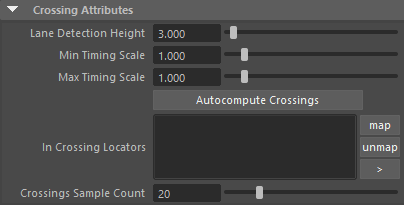 There is a height detection limit, so that crossings can be stacked in height for different roads. Lane Detection height While autocomputing the crossings, the lanes will share a crossing only if the height distance between the crossing and the lane end is lower than this attribute. Min Timing Scale The minimum default timings scale for created crossings (to offset traffic lights). A random value is picked between min and max at creation time, but can be tweaked after. Max Timing Scale The maximum default timings scale for created crossings (to offset traffic lights). A random value is picked between min and max at creation time, but can be tweaked after. Crossing Sample Count While driving on a crossing, each entity will precompute a path from crossing entrance to crossing exit, made of "sample count - 1" segments. This will have an impact on the car orientation smoothness on this crossings. For debugging or understanding purpose, you may want to see the lanes as computed by the simulation. They are only available if a simulation has already run.